When we recently calculated the profit margins of top IT service providers in our HfS IT Services Top 10, it was very apparent that TCS enjoys the highest profit margin, by a considerable distance, of 28.4% among the top 10 global IT services providers and also among the leading offshore centric IT service firms. Hence, not only does TCS enjoy the highest revenue growth in the IT services industry, it is also the most profitable - so what's the secret sauce? The interesting metric to analyze is employee cost per headcount, which has grown from Rs 1.155 Million in 2007 to Rs. 1.240 Million (US $21,200) in 2013 - an annual increase of just 1.2%. This is an outstanding achievement given the high wage hikes in India and other countries. A conservative estimate of 8% annual wage hike in India, 2% hike in developed countries and 4% hike in other developing countries will lead to about 7.5% weighted average annual wage hike for TCS mix of employees. The increase in percentage of freshers impacts service mix in TCS in two ways - Firstly, hiring more freshers gives TCS the flexibility to deploy them in lower value and transactional activities thus freeing other high calibre experienced resources for higher value work. Secondly, training freshers for new skill is easier than retraining old resources for new skills. Thus the increased fresher mix gives TCS the flexibility for cost effective and faster scale-up in new services as well as scale-up in higher value added services. For example, TCS can scale faster and cost effectively in SMAC with freshers, than scaling up with old resources. On the flip side, the increased fresher mix has potential to cause disruption on existing projects. So far TCS has managed its projects well, which is reflected in their repeat business from over 90% of their existing clients. Yes, TCS is investing more in the "top and bottom" and removing the fat in middle. While this move is good for profitability, it has medium and long term HR consequences. With disappearing middle layer the growth path of employees will be uncertain. "Top and bottom" structure in TCS and other IT firms could become similar to the structure in management consulting industry with "up or out" policy. The middle layer in management consulting gets absorbed in industry in either operations or corporate planning roles but in IT there will be no such large scale opportunities. As long as IT services is in the strong growth phase, overall there are opportunities for all IT services professionals and party can go on. The moment the growth suffers, the Indian IT industry will find itself sitting on the HR time-bomb. It appears the profitability endurance is much more tied to controls over labor costs, than advances in delineating headcount from revenue. Is this correct, in your opinion? Yes absolutely. The control over labor costs had significant impact on profitability, whereas delineating headcount from revenue had very little to no impact. There are two reasons why delineating headcount from revenue had not had any significant impact. The first reason is that over all share of delinked revenue is very small. For example in 2013, the revenue from asset leveraged solutions (the non-linear revenue) for TCS was only 2.7% of total TCS 2013 revenue. The second reason is that the growth in headcount-delinked revenue had not been consistent. For example, TCS had negative growth in asset leveraged solutions in 2013. The asset leveraged solution revenue declined by 9.5% in 2013 in comparison to 2012. In my opinion we are few years away when headcount-delinked revenue starts showing any significant impact on profitability. On a related note, there are different management challenges in managing headcount delinked revenue which IT service providers are not able to overcome effectively. Last week, Infosys has formed a separate subsidiary for products, solutions and platforms (PPS) called Edgeverve Systems. We don't know whether this is an isolated case or it will be the trend and other IT service providers will follow this separate subsidiary path for products and headcount delinked revenue. How, in your opinion, is TCS able to maintain the highest growth AND the highest profit margins of all the Indian majors? Surely its competitors can simply copy the model? TCS is very competitive on pricing and it tries to manage its costs instead of price increases. 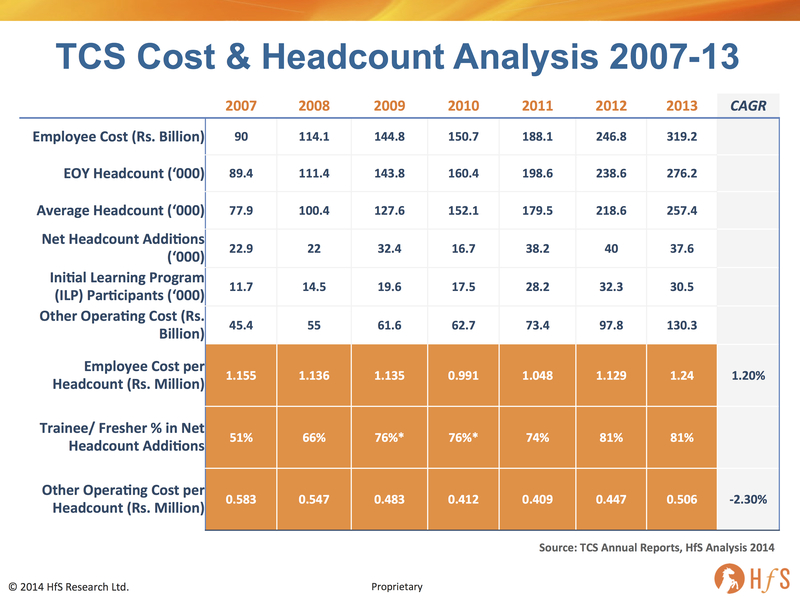 From 2007 to 2013 the average revenue per headcount only increased annually by 0.3%. However, TCS was not the profitability leader among Indian IT services majors few years back. The gap in profitability between TCS and its peers has grown recently as the firm has increased its scale. TCS was able to beat Infosys in profit margin from Oct 2012 only (prior to that, Infosys was profitability leader among Indian majors). The profitability levers we discussed in our TCS study are adopted by all Indian majors, but the difference is in aggressiveness and execution. For example, TCS is most aggressive among Indian majors in using Tier II and Tier III cities. It is constantly scouting for Tier II and Tier III cities and developing facilities to provide future capacity of 8000-10000 FTEs in each of these new cities. We have not been able to compare freshers percentage among the new hires across Indian majors because of lack of credible freshers data, but we believe that TCS will be the most aggressive of all the Indian majors. Finally, it is the cycle of high growth and high profitability which is complementing each other in TCS' case. Because of the high growth, TCS can afford to use both new facilities with economics of scale in Tier II and Tier III cities without disruption to its existing centers, as well hiring more freshers without letting go its middle-level employees. This, in turn, increases the profitability of TCS, and TCS can offer aggressive pricing for both in services to new customers as well as in cross selling opportunities with existing customers. The aggressive pricing increase growth further and the cycle goes on. 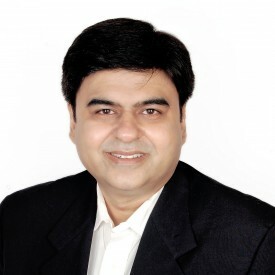 Pareekh, many people argue the Indian model will eventually breakdown as the firms cannot move away from the FTE driven model, and new advances in areas like automation, and Cloud platforms will disrupt the way the services are priced and delivered - and the intensity of labor needed is simply going to reduce. However, I would argue that several of the leading Indian providers are as well placed as any of the Western providers to take advantage of these disruptive technologies to break the linear model. What's your view point in on this? Capability-wise Indian service providers are at par with the western service providers and can offer automation and cloud based business models. But whether they will do it is another question. Historically, disruption in any industry it is not led by the incumbents.The incumbents have vested interest in maintaining the status quo, or a slow growth in disruptive innovation, so that their existing revenue streams are not cannibalized. Kodak didn't suffer because it had no capability in digital photography, more its failiure to see the speed of transition to digital photography - and it didn't refocus and reorient its large profitable film business in time. In the IT services industry, the last major disruption was offshore outsourcing, which was led by India based service providers. The India based service providers scaled so fast that the western providers were left playing catch up (and many failed). Similarly I feel next disruption of automation or cloud based solutions in IT services could be led by the new breed of service providers which can adapt and scale so fast that the existing incumbents (both Indian and western providers) will be left dying on the vine. And finally, Pareekh, how about that Indian election? How will Modi impact the services industry? Is this a good thing for the industry, in your view? On the positive side, the economy is expected to be back on track. The policy paralysis of the previous government has led to the slowdown in new projects and foreign investments. Now new projects will be implemented and foreign direct investment will increase, which will stimulate growth in the domestic IT services sector. Overall growth in the economy will remove many supply side constraints - better power and infrastructure with improve the business environment in Tier II and III cities, which, along with greater tax stability, should be a catalyst for IT services growth. So far the BJP ruled states - Gujarat, Rajasthan, Madhya Pradesh, Chattisgarh and Goa have been laggards in becoming preferred IT services outsourcing destinations, however, with the BJP government, I expect more IT services attraction in Tier III cities in BJP ruled states, such as Jaipur, Ahmedabad, Indore, Goa, Raipur and others. Thanks for your insights, Pareekh. Readers can download their complimentary POV article entitled, "Decoding the Profitability Model of TCS", by clicking here. Hi Pareekh, TCS saw a 9%+ offshore shift between 2007 and 2011, i.e. the proportion of revenues from offshore services. This is what has aided bringing down the cost per employee (also helps working with more freshers). The latter would'nt have been possible without the former. @NP We have listed shift in offshore percentage as one of the profitability lever of TCS. However according to our research the impact of offshore percentage on average employee cost in the period 2007-13 had been minimal and completely negated by exchange rate differences between 2007 and 2013 . In 2013 the onshore revenue percentage of TCS was 49% but TCS had only 8% overseas headcount. The overseas headcount had been in the range of 7-8% from the period data in available in TCS annual reports inspite of fluctuations in offshore/onshore mix. So impact of increase in offshore percentage had no significant effect on overseas headcount percentage. The impact would have been on short term travel and overseas allowance costs. The exchange rate in 2007 was around Rs. 42 to 1 Dollar which increased to Rs. 55-57 range in 2013. So what ever the decrease in travel and allowances might be because of higher offshore mix in 2007-13 was compensated by higher exchange rate. If we include the exchange rate differences, then decrease in average employee cost will be much higher than 6.3% (as our analysis was based on Rupee numbers) but we don't have sufficient information to assess its impact. We believe the main reason of decrease in average employee cost in 2007-13 period is change in employee mix in favour of freshers and junior employees. This model seems to support my opinion of outsourced services - that the knowledgeable "gray beards" come in and wow the client with the depth and breadth of their experience and acumen, and once the job is sold, the school bus full of children with freshly minted degrees show up to get on-the-job training at the customer's expense. Fine if you are hiring bodies with a pulse to perform a well-documented, transaction-based function, but once they run into a problem that requires independent thought and experience - productivity grinds to a halt. It would seem to reinforce "caveat emptor" in selecting a service provider, and require carefully matching the delivery model to the type of service. Empl cost per headcount is for whole company while the %salary hike is only for select few. That should be considered. Quote: "it was quickly apparent that the firm has increased its proportion of “freshers” (recent college grads) has increased from 50% to 80% since 2007"
With this i believe you wish to say that out of the hiring mix possibly 80% are freshers. Fresher hiring strategy to bring down the cost of salary by adding the talent at the bottom is nothing new. It also helps in keeping the pyramid balanced and also offers growth path to people. Another factor that brings the cost down is the attrition of higher salaried people which normally get replaced by promoting people from below and the chain continues. People who joined in 2007 will be seniors by now and many of them would have already left making the space below. TCS retains its staff. Have met TCS folks who have been with the company for 20+ years. Because employee churn is less, HR costs too are less. Governance overheads are minimal in comparison to the large MNC IT Cos. A typical TCS leader wears many hats and that alone does away with the need to hire PMO staff. It's a very well oiled machinery running primarily on the Tata Group's ideology of giving good work to its people and retaining the talent - whether they be brilliant or average. This is consistent with their strategy and to be expected in the context of the outsourcing model in India. Till such time the india based players evolve to the next generation models the primary growth is going to be increasingly the traditional outsourcing large deals, are largely around the commoditized infrastructure operation contracts. TCS and HCL are best positioned for those. Pricing and costs are going to be under pressure for such labor based legacy models. That TCS continues to maintain margins through managing the mix favourably to lowering average cost per hour is to be expected. If you look at the other players as well you will notice similar efforts underway (Infosys, Wipro etc. ), even if the general commentary is just the opposite. The fresher driven approach delivers well, especially as TCS is able to keep pumping in the large outsourcing deals that need the labor. The deals dry up, then it gets tricky. I would not worry about the vaccum in the middle, there will be the natural progression for the lower level to the next and to middle level management. Ofcourse, the role and structure will change at all levels (not just in the middle) due to efficiency, automation initiatives. This is not the model for the future, but it continues to work for now. Agree that the scenario of a new breed of players emerging in the next 5 years is very feasible. Why is this situation an HR time-bomb? 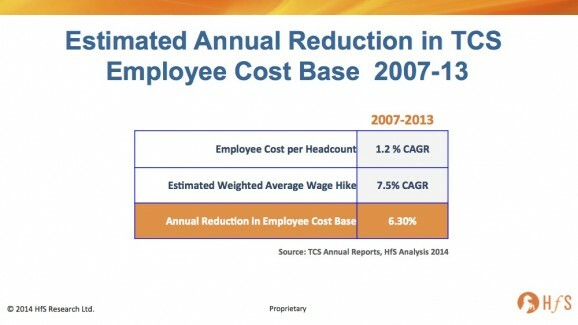 This is a very good analysis of TCS employee and labor cost metrics. As an ex-TCSer, I watch TCS with keen interest. Thank you Mr Jain.